Welcome to Molly’s, a Devonport institution that has a reputation unsurpassed on the North West Coast for great value dining, comfortable bars, state-of-the-art gaming room, free entertainment and great craic! Whether it’s catching up with friends or partying the night away, Molly’s is the place to be on Saturday nights with great entertainment every week – and no cover charge. Come and experience the great atmosphere at Molly’s today. The youngest daughter of fishmongers Patrick & Colleen, Molly Malone is a popular Irish figure who is said to have lived in Dublin in the 19th century. Legend has it that her beauty was unrivalled in the village, which made her passing at the tender age of 17 a tragedy for the local lads. Such was the outpouring of grief that the pubs for 16 miles in every direction were obliged to stay open around the clock for three days following her untimely death! Cheese and onion pull-apart, baked fresh today and served with garlic butter. Traditional oven baked garlic bread. Where else would you go for an authentic Irish stew? Tender lamb and root vegetables in a rich gravy with mash. Served with a warm crusty roll. Prime beef and vegetables slow cooked in Guinness and topped with puff pastry. Pork, apple and sultana sausages on a creamy mash. Served with bacon, and beer battered onion rings and gravy. A succulent chicken breast, lightly crumbed with chips and a complimentary sauce. Crumbed eggplant parmigiana topped with Napoli sauce, sliced zucchini and mozzarella and tasty cheese. Filo parcel filled with chicken breast, spinach, prawns, pesto and brie. Topped with hollandaise sauce. All of our Australian beef is hormone free, delivered fresh and cooked to your liking with your choice of complimentary sauce and your choice of sides - chips, salad/coleslaw, or vegetables. For maximum flavour and tenderness we recommend all our steaks are cooked rare to medium. Please allow 40 minutes for well done steaks. A well-marbled and juicy steak, packed full of flavour. Katsu chicken thigh burger with slaw and lime mayo. Served with chips. Tender char grilled scotch fillet, bacon, cheese, onion, rocket, aioli and tomato relish. Served with chips. Please ask our staff or see our specials board for daily options. Served on a mountain of mash, with broccoli trees and tomato sauce lava or chips. Ham and cheese toastie, fresh fruit, cheese and crackers. 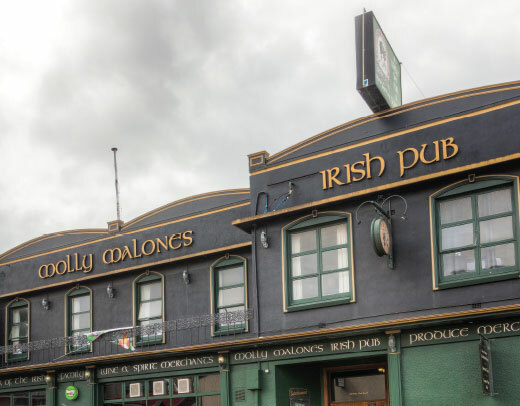 Molly Malone’s is THE place to go for the best craic on the North West Coast, with 4 great bars to choose from. With a fantastic range of local and international beers on tap, Mollys is the only place in Devonport to serve Guinness the way it should be – straight from the tap! At the Sports Bar at Mollys you can also catch all of the latest national and international sports on the Foxtel screens! The Front Bar is a great place to catch up with friends, with a relaxed vibe. There’s live music every Thursday night. Happy Hour is 5pm – 7pm every Friday and is the place to go for an after work drink or to start off your night out. The Restaurant Bar is where it all happens on a Saturday night with live music on the main stage and a packed dance floor. We offer great value beer, wine and spirit specials ALL day, EVERY day. Molly Malones is a great place to base yourself when touring the north of Tasmania. We offer great backpacker-style accommodation at a great price! We have a range of rooms available including 1 & 2 bed, ensuites & bunks. The Molly Malones Hotel is committed to giving back to the communities in which we do business.